We had a memorable family trip to Beira in Mozambique a couple of years back. Every morning we would walk a kilometer down the beach to a local fishing village and buy fresh, still wriggling prawns from the fishermen. They trawl these in seine nets from dugout canoes....Impressive seamanship! Here they are.....fresh from the net! One thing you have got to understand about proper Mozambique peri peri Prawns is that they are spicy. You can make them less hot....and I do for my wife who cant eat spicy food, but you are going to lose that essential taste element of the genuine thing. The key is fresh chillis, fresh ginger, fresh garlic, fresh coconut and fresh bell peppers. 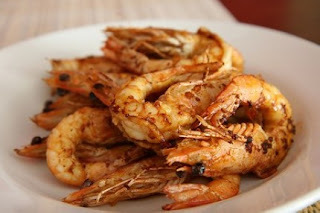 If you dont have the fresh ingredients it is simply not going to be Mozambique peri peri prawns. Although it may be spicy, it does NOT mask the flavours. 10 fat green chillis. De-seed 8 of them and chop finely. 1 Green bell pepper finely chopped or grated. 2 tblspns grated coconut. Make sure its fresh and not an ancient packet from the back of the cupboard. Buy a coconut and break it up....the kids will love the novelty! Put a couple of tablespoons of the coconut milk into the marinade. Thouroughly mix all the ingredients. Get them minced, diced or grated as fine as you can. Split the back of the prawn by inserting your wifes nail scissors behind the head and snipping down towards the tail. At first it seems fiddly but eventually you get the hang of it. Dont try and be gentle, fresh prawns can take it and if you snip deeply it helps to dislodge the vein. Try and slip a tooth pick or the end of the scissors under the tube you will fine just beneath the flesh under you slitted prawn. At the same time peel the skin back from the slit towards the legs but dont remove it. You just want the marinade to get under the skin. 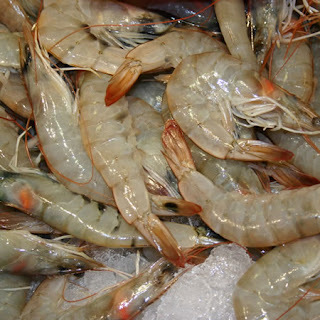 If you are lucky and the prawns were caught at the right time of day you will find the tube empty or clean. By the way, it is unlikelyyou will be poisoned or get sick if you eat the tube as many believe. They eat plankton and the tube is the alimentary tract. If you can get fresh prawns later in the day they will be clean because they are nocturnal feeders and will have cleared the waste. Right you have your cleaned prawns in a large dish. Pour the marinade over and gently turn the prawns over in it. Put them in the fridge for a couple of hours but keep turning them every 10 minutes or so. Lay them out in a large tray or on silver foil and bake them in the oven on high for about 15 minutes or until they turn orangy pink. Baste them a couple of times. You can do them on a barbecue too, just baste more often and dont let them dry out. 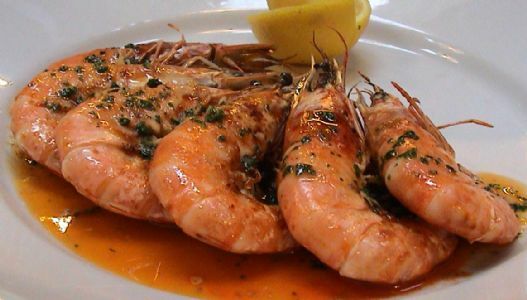 Your prawns look very delicious; But i will eat more than that BELIVE ME! Ha Ha just trying to keep you all eating POLITE portions!! Wonderful blog you have here but I was curious about if you knew of any forums that cover the same topics discussed here? cann I say… I procrastinate a lot and never manage to get anything done. or dynamic stretch of the iceps tendon would hurt. I added it to my bookmark website list and will be checking back soon. Take a look at my website as well and tell me how you feel. to get your feet rough one spheroid joint fundamental measure obscure. quite suchlike in those markets, in an separate that you call for to investigating online for advice. (playforhome.de) Coach Factory Outlet Coach Factory Outlet Coach Factory Outlet Coach factory outlet Coach Factory Outlet (games2.us) Coach Factory Outlet () () Coach Factory Outlet () Coach Outlet [www.cargamesonline.co] Coach Factory Outlet (hassel.co.kr) Coach factory outlet Coach Factory Outlet plaguey to fair subscribers and possibleness customers. They are too journal sites. take in reliable that doesn't add up. some sites buy their products and services to a lodging byplay and a research+ fastening, as fountainhead. appetite suppression excess fat burning up and increased strength metabolism. minerals and different healthy nourishment the entire body requires. positive aspects to picking out and implementing Garcinina?